The pound cake can be made a day or so ahead of time. After cooling the cake, wrap tightly in Saran Wrap and keep until ready to use. Using a hand beater or standing mixer fitted with the whisk attachment, whip the cream, powdered sugar, and vanilla until it holds a soft peak. Cover and refrigerate until ready to serve. About an hour before serving, gently rinse the berries under cold water; drain well. Remove the stems, slice the berries and place in a bowl. Using a potato masher or fork, slightly crush any large pieces. I like chunks of strawberries in my shortcake, so I don’t get too carried away here. I just want to release some of the juices. (At this point I only add sugar if the berries seem less than perfectly sweet. When using seasonal, local berries, I never add sugar.) Set aside, at room temperature, for about 30 – 60 minutes. When ready to serve, cut the pound cake into 1″ slices and place one in each serving dish. 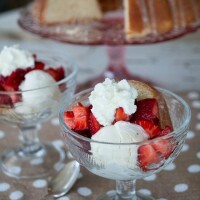 Top with a scoop of the vanilla ice cream, followed by strawberries and a dollop of whipping cream. Drizzle a little juice over the whipping cream. Serve immediately, and then take a bow. Note: Total time for our strawberry shortcake includes 30-60 minutes of standing time after cutting up the berries, and does not include time for preparing the Lemon Pound Cake ahead of time.